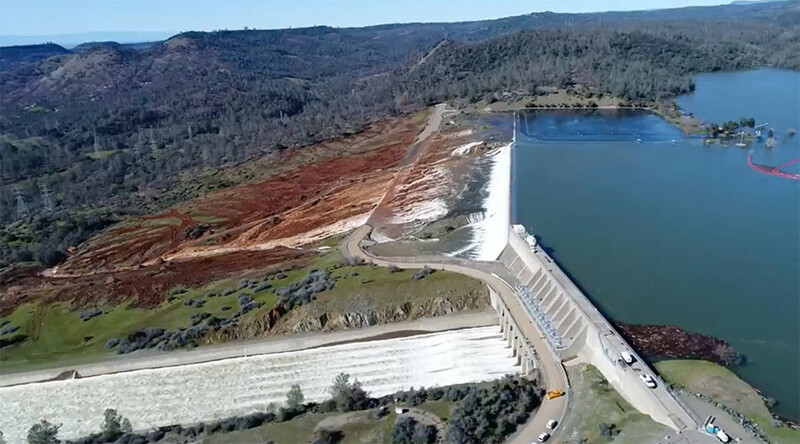 Aerial footage filmed above the damaged Oroville spillway in California just one day before 188,000 local residents were evacuated shows the incredible scale of America’s tallest dam – and the magnitude of the problem facing its engineers. Officials discovered serious erosion in the structure’s spillway on Sunday, sparking an emergency evacuation of the surrounding area. Authorities and emergency crews reacted quickly to the crisis which could have triggered the dam’s collapse, destroying downstream homes in Butte County, Marysville and Yuba County. Further footage, captured over the dam, showed the severe erosion in greater detail. Three environmental agencies issued a warning over a decade ago that the dam could be in danger of eroding. The agencies contacted the Federal Energy Regulatory Commission, urging the commission to check the dam’s existing structures and possibly reconstruct the “ungated spillway”. Oroville Dam operators have been attempting to drain the lake by releasing 748,000 gallons of water per second. California governor Jerry Brown has appealed to President Donald Trump to declare a state of emergency “as a result of the potential failure of the lake Oroville Dam emergency spillway”. The evacuated residents have spent a second night in emergency accommodation and are still awaiting information on when they can safely return home. Placer County Sheriff's Office graveyard deputies finally getting a chance to get some sleep this morning, after a long night assisting others in staying safe. They will be back on duty there tonight, too. Hopefully a large-scale crisis has been averted, and life will soon return to normal for all the evacuated residents who live below the Oroville Dam.